This fanciful figurine, based on a design from Amy Brown, features a fairy reclining amid leaves and pink flowers. The pixie has wings in a rosy shade that matches the primrose blossoms, and are edged with green. Her rich red-brown hair falls over her shoulders and back as she stares off into the air, daydreaming. 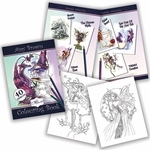 This collectible is sure to delight any faery lover!